When the head and neck deviate from their natural alignment by an unsupportive pillow, compression occurs in the respiratory airway, located in the back of the throat, known as the oropharynx. When this area becomes bent or constricted a distortion occurs in the throat region resisting airflow; hence the snore. WonderFlex® can help prevent snoring because it’s easily customized to support the natural anatomical alignment of your head and neck, holding you in perfect position; even as you move throughout the night. By sleeping with WonderFlex your breathing airway can be properly aligned and free of constriction, and the snoring stops. There are all types of allergies, many hidden in foods, the dust in your home or work environment, allergies can be caused from insects, pets, plants, medications, molds, even on, or in, your bed and pillow. WonderFlex® is Hypoallergenic & Anti-microbial. Not only is the WonderFlex extremely comfortable and completely supportive of your head and neck, it also protects you from those disgusting little critters you cannot see, unless you’re looking through the lens of a high-powered microscope. So if you’re experiencing insomnia, tossing and turning, sneezing or coughing, nasal congestion, or low energy levels, its time for you to rely on WonderFlex® to help you sleep safely and to protect you all night long. Sleep Apnea is a serious problem for millions of people, a condition that dangerously disturbs breathing patterns, all night long. WonderFlex® is unique because it perfectly conforms to the natural alignment of the airway inside the neck region. Many people with sleep apnea have to use a CPAP device, (Continuous Positive Airway Pressure) which attempts to maintain the airflow into and out of the respiratory system. If untreated, people with Sleep Apnea are more prone to higher rates of illnesses, diseases and accidents. If you have Sleep Apnea ask your doctor what’s the best medical treatment, and make sure you’re sleeping with a WonderFlex® to give you the personalized support your head, neck and breathing airway so desperately need. The WonderFlex® can benefit anyone who experiences the discomfort, frustration and fatigue brought on by a number of night-time issues. Whether you suffer from snoring or poor sleep quality, a stiff neck or restless legs, the WonderFlex® provides a better sleep solution! Chronic insomnia is a serious condition that must be addressed, starting by NOT sleeping with an unsupportive pillow. Rather, what we need is a supportive, conforming pillow, and that’s exactly what the WonderFlex® offers: the first of its kind in the world. WonderFlex® is clinically proven to be an amazingly effective sleep necessity that helps you fall asleep quicker; sleep longer, and you’ll wake up refreshed and energized. So if you’re constantly struggling to get a great nights’ sleep, let the WonderFlex® cuddle up to you each and every night: WonderFlex® really can change your life! Who would ever imagine we could get injured while sleeping? But it happens every night to millions of people! One of the most prevalent sleep injuries targets the neck; the cervical nerves/vertebrae. The WonderFlex® is engineered to assist you with proper ‘Sleep Technique’ holding your head, neck and entire spinal column in the proper anatomical alignment as you sleep. Other pillows lack support: they always collapse, and have ‘no’ conform-ability, throwing your neck out of alignment, and this is how we injure our necks and spinal columns when we’re sleeping. WonderFlex® is different: It can be quickly positioned to support your entire head and neck, and you’ll automatically remain in a balanced, healthy position as you sleep. Restless Leg Syndrome (RLS) is an annoying condition that always seems to happen most when one is trying to fall asleep. Some of the ‘causes’ for RLS include muscular weakness, poor circulation of blood and nerve transmissions, being overly fatigued, and sleeping with an unsupportive mattress or pillow. WonderFlex® comforts your entire spinal column; the headquarters of your Central Nervous System, by maintaining proper alignment. The benefits also travel across the pelvic region and into the lower extremities of the legs and feet. With its unique and exclusive conform-ability, WonderFlex® allows your body to relax and be freed up from tension. So if you’re constantly kicking all night long trying to ‘kick’ out the irritating tingling in your legs, WonderFlex® is a tremendously useful sleep aid that will align your head, neck, spine, pelvis and legs, and help you relax, sleep and awaken totally refreshed. Fibromyalgia is a musculoskeletal medical condition that results in chronic fatigue, sleep disorders, and pain. 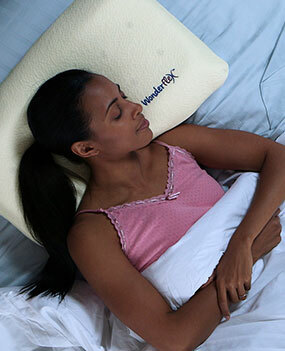 WonderFlex® is the ultimate sleep aid as it reduces the stress and tension in your head and neck, and entire body. When your head and neck are supported, so is your entire Central Nervous System. Circulation of blood and nerve energy is freed up, and your muscles and nerves are relaxed, and you sleep great. WonderFlex® provides that deep, rejuvenating sleep that keeps your body, and brain, young, resilient and healthy. Tossing and turning can be instigated by flimsy, unsupportive pillows. The head collapses, pinching the cervical nerves, sending signals all over your body, causing a chain reaction that forces you to kick and flutter all night long. WonderFlex® personally conforms to your head and neck region, and when they are properly aligned, your entire body becomes comfortable, protected and relaxed. WonderFlex® has been shown to reduce tossing and turning through intensive sleep-lab studies. The exclusive Comfort Flexors allow personalized support for your head and neck; and when your head and neck are aligned, so is your spinal column, and your brain and body can begin to relax. WonderFlex® allows you to sleep like a baby, then wake up super refreshed because the energy you’d normally expend during those restless nights is now the energy you’ll have available for your upcoming days ahead! So stop the flopping and kicking. WonderFlex® is the healthy, smart way! Temporomandibular Joint (TMJ) Disorder is a condition that attacks the attachment of the jawbone to the skull. When we observe how a side-sleepers’ jaw gets compressed when using a regular pillow, it's obvious that distortion/compression is exerted to this sensitive joint, and understand the associated pain that comes afterwards. The WonderFlex® exclusive internal structure, allows every user to avoid this compression, by simply, and quickly, adjusting the height of WonderFlex® under the side of your face – your head is comfortably held up, and you are free from undo pressure. If you have TMJ, check with your doctor to pinpoint the exact cause but also make sure you’re sleeping with your WonderFlex® to keep your head, face and neck happy and healthy. WonderFlex® is terrific at helping you escape many of the aches and pains of the day. One of which are headaches; bad enough, but when people experience ‘migraines’ it ‘ups’ the level of discomfort, and pain, to an entirely new level. The bottom line, those experiencing headaches need relief. And one of the best ways to eradicate a headache is to ‘sleep it off’. That’s where WonderFlex® is extremely effective. This pillow will completely cushion any sore, aching head, providing personalized comfort to your entire neck and spinal column. When the head and neck are in proper alignment, you’re relieved of pressure and tension, and your brain is happy. WonderFlex® will help you relax, fall asleep, then wake up refreshed. So if you have a headache take a well-deserved ‘time-out’ from your stressful day, to catch a catnap, or your regularly scheduled nighttime sleep, and rely on your WonderFlex® to make certain you sleep away all your aches and pains. These statements have not been evaluated by the Food and Drug Administration. This product is not intended to diagnose, treat, cure, or prevent any disease. Consult your physician if you believe you have a serious sleep disorder.